In the business world, Savannah James has made a mark as an Amazon who has gone beyond every limitation to establish as a renowned entrepreneur. Also by getting married to the most celebrated NBA player, LeBron James, her life has constantly been on the spotlight as she is best known as the wife of the basketball superstar. Despite living a luxury life, James has never lost sight of her background, being a source of inspiration and hope to many who are less privileged through her multiple acts of benevolence. As a philanthropist, she has sponsored community projects by providing education resource materials as well as prom dresses to girls who are in their senior year. Below are more interesting details of the successful entrepreneur. LeBron James‘ wife was born as Savannah Rachael Brinson in Akron, Ohio, US, on 27th August 1986. She is the youngest child of J. K and Jennifer Brinson and has four older siblings. She graduated from Buchtel High School and while she was there, she participated in many of her school’s sports event as she was a member of the softball team and also among the cheerleaders. Following her passion for stunning interior decoration, Savannah James launched her career as an interior designer through creating her fabulous furniture line in the name of Home Court, specializing mostly on kids products. She also formed a partnership with a notable furniture brand, American Signature. In addition, she has gone ahead to invent a mentorship project named Women of Our Future, with the aim of making a great impact in the society beginning from her home town, Akron, Ohio. Her mentorship project is solely focused on assisting women to get the best education and also to inspire them to go further in higher education. The popular businesswoman also made a charity donation of prom dresses through her ‘I Promise Makeover Campaign’ to a local school in order to aid the senior girls who are financially deprived to fulfill their dreams of attending prom. Furthermore, Savannah James recently occupies the executive position of the Vice President of the LeBron James Foundation. Although the notable businesswoman has acquired a fortune from her various line of businesses throughout the years, she has not disclosed her financial value to the public as her personal net worth is reportedly unavailable. The founder of Home Court met LeBron James when she was 16, during a football match and there, the NBA superstar offered her an invitation to his school, St. Vincent-St. Mary High School’s basketball game. Two years later, when Savannah James was 18, the pair started dating while still in high school. Following their nine years long term relationship, LeBron James popped the question to his high school girlfriend with a flashy 7-carat pear-shaped diamond ring on 2012 New Year’s Eve. Then in the next year, on 14th September, the couple exchanged vows in San Diego, California, in a low-key ceremony where they had about 200 guests in attendance. The wedding was quite sumptuous as it lasted for three days and included a live performance by Beyonce. Having kicked off her love affair with LeBron James while in high school, Savannah James welcomed her first child a son, LeBron Raymone James Jr. in October 2014, when she was still a senior year student. Later in 2017, the famous interior designer gave birth to her second son named, Bryce Maximus James and after her wedding in 2013, her daughter Zhuri Nova James was born in the following year. Savannah James is married to a four-time NBA Most Valuable Player, who has attained two Olympic gold medals. LeBron James is a professional basketball player, who as of 2019 plays for the Los Angeles Lakers. His career achievements have no bounds as he has accomplished many ground-breaking new records in the National Basketball Association. LeBron James, thanks to his impressive career achievements, has also acquired a huge fortune from. He is being rated among NBA’s highest-paid players and is said to worth $440 million. Savannah James was surprised by her husband on her 30th birthday as he handed the key of a brand new Ferrari to her in appreciation of her supporting role over the years. 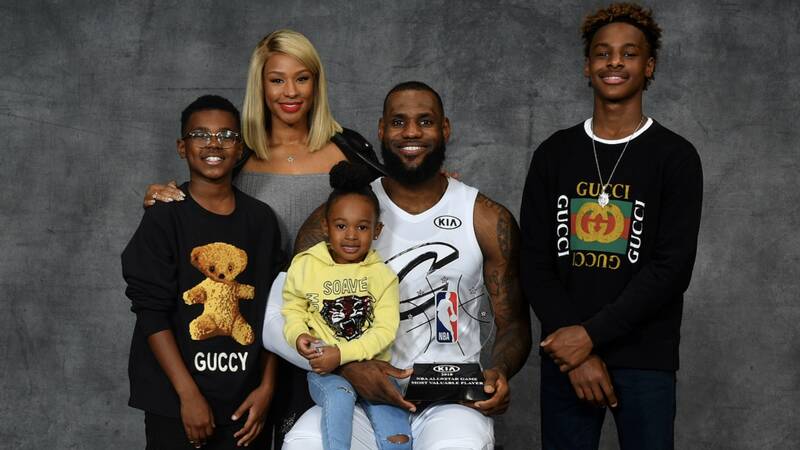 The beautiful wife of LeBron James stands at a height of 5 feet 9 inches (1.75m) which is slightly above the average height of an American female, stated as 5 feet 5 inches (1.65m). She also weighs about 60kg (132 lbs).